Are you a fan of pesto or pad thai? Growing basil is easy and quickly rewards a gardener with lush, fragranced foliage. There are several basil varieties, but they live happily in similar conditions. 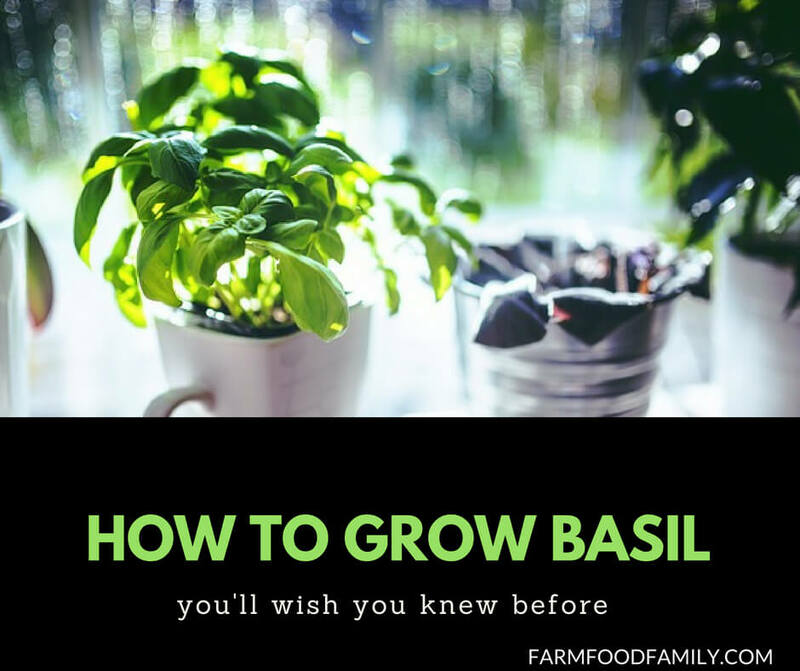 Below you will find a description of the basil plant, including its height, hardiness, and flower; light, moisture, and soil requirements; cultivation tips for keeping your growing basil healthy and tasty; our favorites varieties; and some ideas for how to use basil in your home. Basil is can be a bushy, warmth-loving shrub 12-24 inches tall and 12-18 inches wide, or a leggy vase shape if you don’t start pinching it early. Depending on the variety, it will have sweet, small white-ish flowers beginning as early as June. Basil will die with the frosts, but fresh basil is so far superior to the dried herb that I am happy to grow it as an annual every year. Design idea: plan to bump into your basil on occasion to release that amazing smell. Placing it beside the gate or as part of the mailbox garden will help strike the balance between brushing against and stomping on. Moisture: Moderate. Basil is kin to mint: it doesn’t need as steady a water supply, but it does like a lil somethin’ somethin’ on a semi-regular basis. Soil: On the rich side, and definitely well drained. I often include basil in my tomato, eggplant, and peppers bed, along with yarrow, french marigolds, and sometimes even petunias. Starting Basil from seed is easy, but if you are pushed for space in your seedling tray, it transplants easily and babies are as-good-as guaranteed to be at the farmer’s market. Space the seeds 8-12 inches apart, cover them with just a 1/4 inch of dirt. Put the tray on a seedling hat mat or in a warmish spot. They’ll be up in a week or two. Cultivating Basil: Though lovely, once your basil flowers, the leaves become rather bitter and trigger the plant that its life is over. Unless you plan to save the seeds, “pinch” growing tips back regularly to encourage sweet, bushy growth and a longer growth cycle. We like sweet, big-leaved Italian basil or Sweet basil, especially the cultivar Genovese, for making pesto. Thai basil has pungent anise undertones and purple stems, both gorgeous and favorful. I’ve had good luck with Queen of Siam, but am continuing to experiment. A fiend for color? There are red and purple leaved basil varieties out there. Seeds of Change has a marvelous high yield Ren Rubin purple basil. Container gardening? Try Greek basil, Fino Verde basil, or the variety Minimum. Of these, Greek is probably the most familiar to you, as this is often in the window boxes and patio planters of Greek restaurants. Indispensible in Italian cuisines, basil is at home in any tomato, eggplant, or pepper dish. Its sweetness is excellent in balancing out the heat in many curry or pho dishes, BUT in excess basil will create heat of its own. Many Thai curries push this line, and then use coconut to step back from the heat. To flavor oils or vinegars, steep sprigs of basil in the bottles. A natural marriage with thyme, parsley, and garlic.